Kanchipuram, a city situated near Chennai Tamil Nadu, has been the epic centre of silk sarees. Silk sarees are part of the rich Indian culture and plays the role of bible for any season. Right from weddings to any festivities or family functions, the celebration is fulfilled without kanjeevaram silk sarees. The legacy goes that the ancient Indian saint markanda has passed on the knowledge of weaving silk sarees to his descendants. Saint Markanda is believed to the one who weave for gods alike Shiva and Vishnu. The city Kanchipuram became popular before 400 years back when two weaving communities called saligars and devangas migrated. The skill and learning are passed on to the next generations to preserve the art of silk weaving. Kanchipuram silk sarees are hand oven from mulberry silk thread. The raw materials that go into the silk sarees are mulberry silk thread, metallic threads(Zari) and dyes. The kanchipuram silk saree contains three parts-Body, Pallu and border. Three single threads of silk yarn is used to weave the saree. The uniqueness of these sarees is that the body and border is quite different in color and in contrast to each other. If the color or shade of the pallu is different from the body and border, the pallu is woven separately and attached to the body skilfully. There are new designs, themes and motifs being introduced in the weaving to adopt the changing likes and dislikes of the young generation. The tradition demands that there should be at least one single silk saree in every women’s wardrobe. 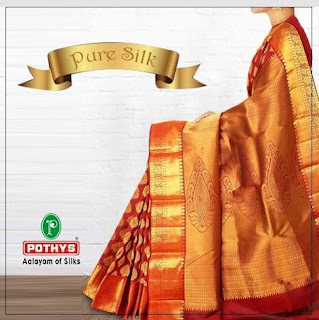 Today there are many online e-commerce portals which offers Kanchipuram silks online. Pothys a synonymous name in the silk sarees has many collections with different themes and designs. Visit www.pothys.com to buy one now.